CHILBROOK LABRADORS was established in 1969 by Debby Kay with the goal of creating a select bloodline of versatile performance dogs. Temperament and soundness have been critical selection factors in all our breedings and choice of studs. Dogs from Chilbrook lines have succeeded as detector dogs, guides for the blind, service dogs for the physically challenged, seizure alert dogs, search and rescue dogs, specialty and group winning show champions, grand master champions in the field, High in Trial obedience competitors, rally, tracking and agility. We welcome you to explore this site to see what today’s Labrador Retriever can do—compete successfully in conformation and performance events, work as medical alert dogs, detection dogs, and service dogs for all types of disabilities, join you in the field as a hunting partner, and of course, be good family friends. DEBBY KAY is a founding officer of the Labrador Retriever Club of the Potomac and a member of the Labrador Retriever Club Inc. She is a professional member of the Dog Writers Association of America and the Association of Professional Dog Trainers. Chilbrook Limerick CD CGC TDI (left), Am. Can. Champion Chilbrook Solitaire CD CGC TDI (lying down) and English Import Champion Majestic Saxton. 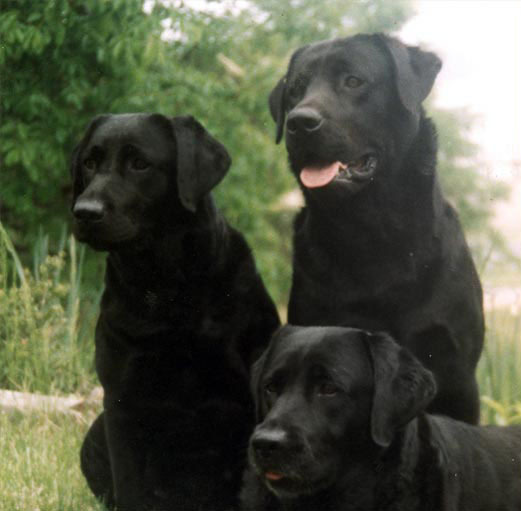 These three extraordinary Labradors are the backbone of the Chilbrook bloodlines.